With traffic already heavy on Anna Maria Island for tourist season, spring break the week of March 10-16 brought more vehicles to the island, especially with fairly decent weather, said Bradenton Beach Police Chief Sam Speciale. Additionally, Manatee County is creating a nature preserve along Manatee Avenue near Perico Bay. Trucks are being loaded with fill from the project and a flagging operation is in place to halt traffic in both directions while the trucks exit the project, he noted. A Bradenton police cruiser with lights flashing sits on the south side of Manatee Avenue at the project entrance and motorists always slow when they see a police cruiser flashing its lights. It just makes getting on and off Anna Maria Island via Manatee Avenue that much slower during spring break, the chief said. A traffic problem in Bradenton Beach is launched each time the Cortez drawbridge goes up to allow boat traffic to pass. “With the spring break crowd, people coming from Longboat Key and motorists going south to Cortez Road, raising the Cortez draw create incredible traffic backups. Remember, the only way off Longboat Key is by bridge, either going north or south. I’ve said it before, but everyone driving on the island needs to remain calm and we’ll get through this fine,” Speciale said. Spring break for area public schools ended March 15 and most Florida public universities had spring break the same week. With Easter on March 31 this year, Speciale said he expected some people would return north after that holiday. “After the Easter holiday is traditionally a time when some people start heading back north. If Easter were in late April, many would stay through the month before leaving. 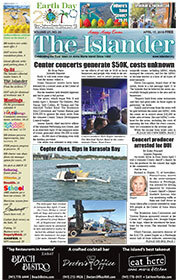 With Easter coming early, I think traffic on the island will start to clear out this year after March,” the chief said.